In addition to many photographs, the surprise discovery of a second Cheshire photo album yielded a gem of information in the form of a news clipping pasted onto the book’s suede interior back cover. The newsprint is a little worse for wear, but clearly legible, and features a photo of a beautiful and elegant Ursula. 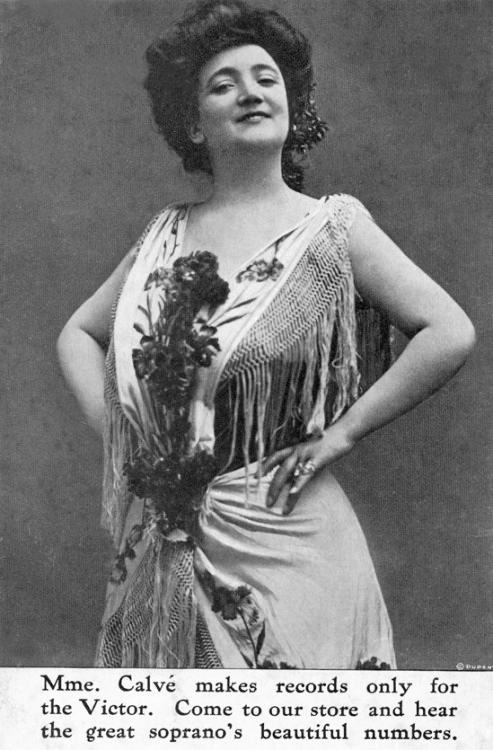 According to the article, in addition to “voice culture,” Ursula’s studies in France would include dramatics and dancing. To be invited to study with the eminent opera singer was high praise, indeed, for Miss Ursula Cheshire. 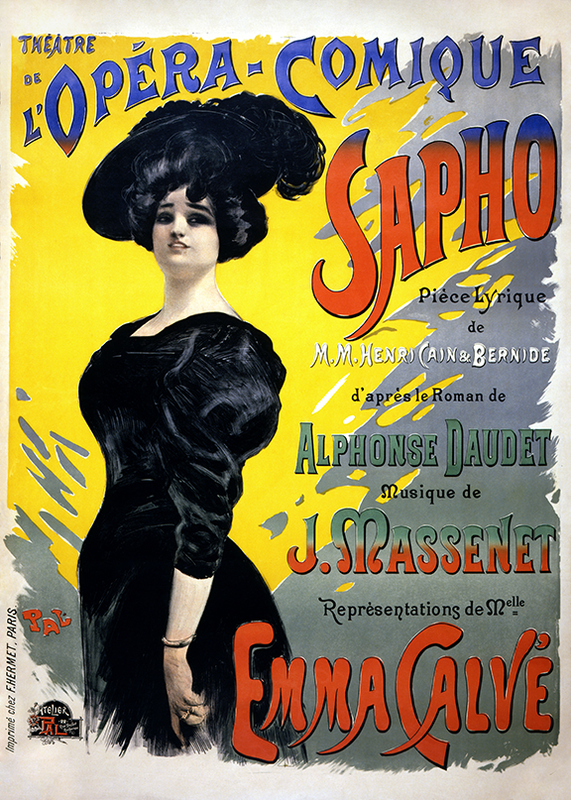 At the time, Calvé would have been 65 years old, just three years older than when she made this recording (music starts at 15 seconds in), and one year before she retired from the stage to focus solely on teaching. In my research, I discovered that Calve penned an autobiography in 1922. 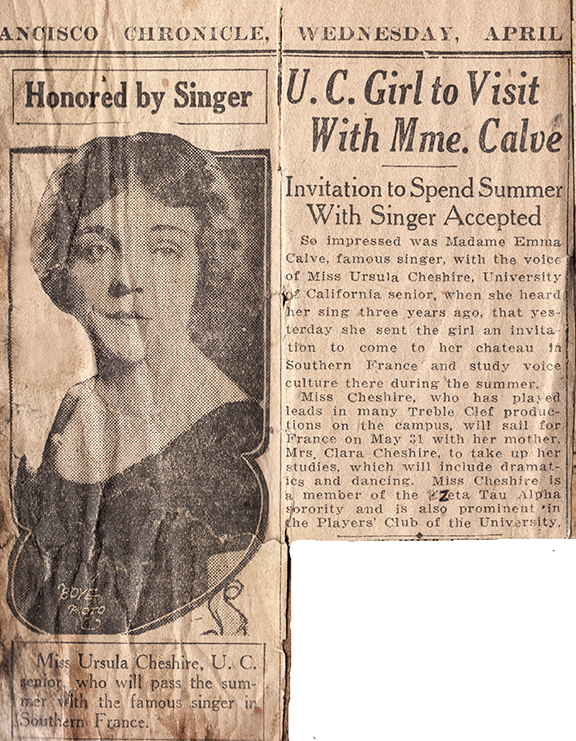 In the book, titled My Life, she wrote about the summers during which she “filled my castle on the hilltop with different groups of young girls who have come to study with me.” It offers a rare glimpse of what Ursula’s time there would have been like, about which I will share in the next Mystery Dancer post. Until then, adieu! Ursula’s passport application, 1924. Notice her signature at the bottom of the left-hand page. Apparently, posing for a passport photo was stern business. Ursula Cheshire (top), age 21; and Clara Cheshire, age 52. Just as one adventure was ending for Ursula, another was beginning. The very day she graduated from U.C. Berkeley—May 14, 1924—the U.S. Department of State issued passports to Ursula and her mother, Clara. According to Ursula’s passport application, new adventures awaited her in England, Italy, France, Switzerland and Germany, where she was going for “travel and study,” apparently with her mother as chaperone. I learned from her application that 21-year-old Ursula stood 5 feet, 4 inches—one inch taller than her mother—and had blue eyes and dark brown hair. 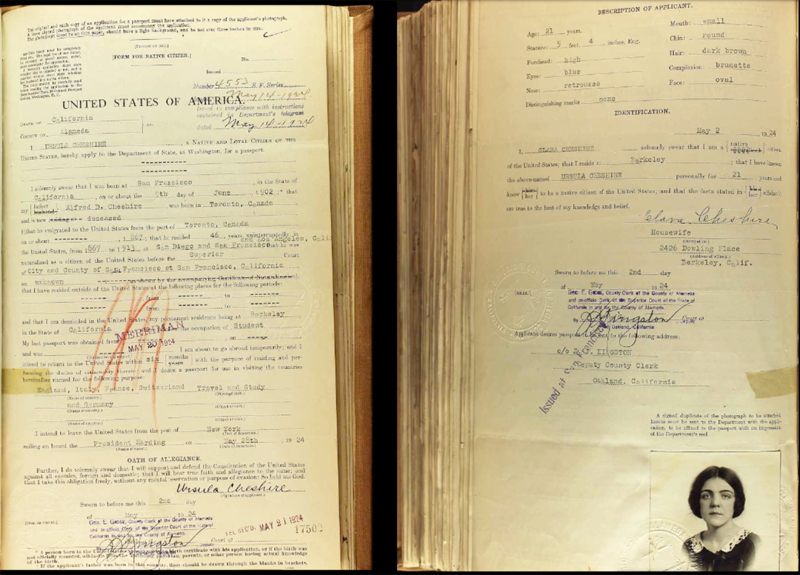 How cool is it that we have an image of her actual passport application (found on Ancestry.com), signed by her own hand (see above)?! 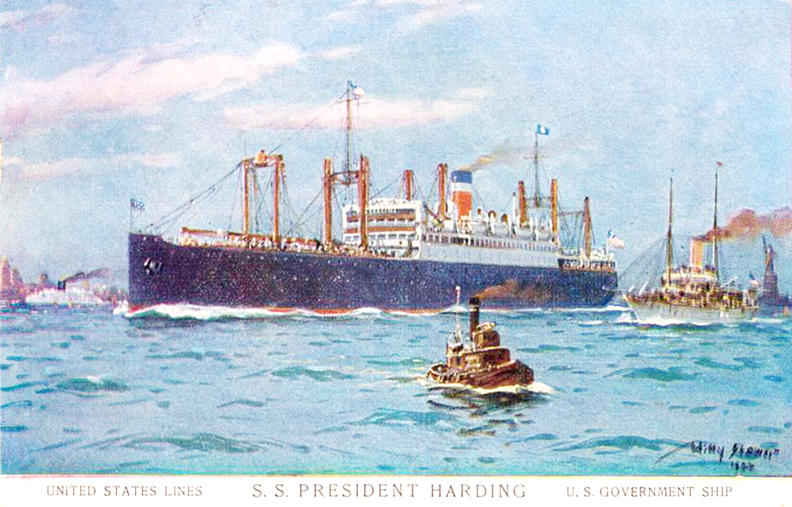 Mother and daughter were to set sail for Europe from the port of New York aboard the S.S. President Harding. Relatively new, this steel passenger ship was built in 1921 and went into transatlantic service in 1922, powered by two steam turbines. I’m not sure how they got to New York, but at that time, Californians traveled there by ship (sailing through the Panama Canal) or rail. I suspect they went by ship, as that was probably the more comfortable and classy way to travel back then. Stay tuned for more about Ursula’s travels, coming in the next post. Bon voyage!